Dedicated computer for Carbide Motion? I bought a Mac Mini on eBay for $120, and it’s now my dedicated Nomad/Printer machine. I got tired of plugging and unplugging my main notebook. I also figure that the Mini can be more readily sacrificed to the potentially dusty environment. I installed bCNC on a beaglebones black. 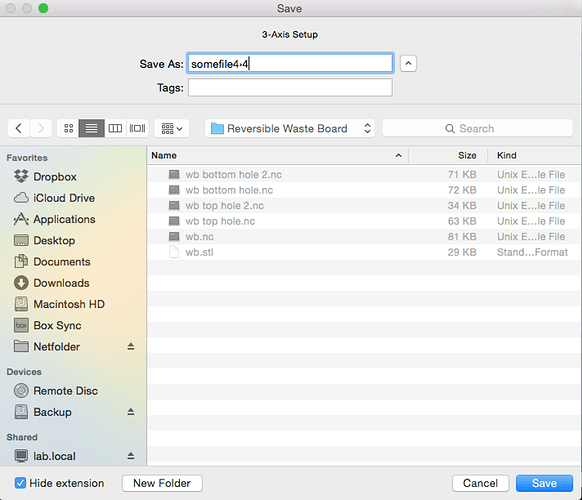 Files are accesible from a samba share so no ftp’ing stuff over. Quite happy with it. Notice that meshcam generates M6 (tool change) and G1A0000.0 commands that must be edited out. I will write some cleanup scripts for that. @TotallyFred, what MeshCAM postprocessor are you using? and the A000.0 should not appear in the gcode. For the M6 (MC puts in an M6 every time it encounters a new tool number) you can comment out that line in the TOOLCHANGE section of the postprocessor by adding a semicolon to the front. You’ll need to have your tool loaded and zeroed because MeshCAM will turn on the spindle and start moving straightaway. I’m using a TW100 Winbook and a usb keypad without any issues. I posted this a while back. @Randy This is very interesting! After your post, I started reading about post processors and this actually addresses a great question that has been bugging me for a while but did not know how to phrase. I found the doc and googled forums around but I am still somewhat stuck: no instructions for MeshCam for Mac. When I save the toolpath, there is no option in the dialog box to select a post processor. 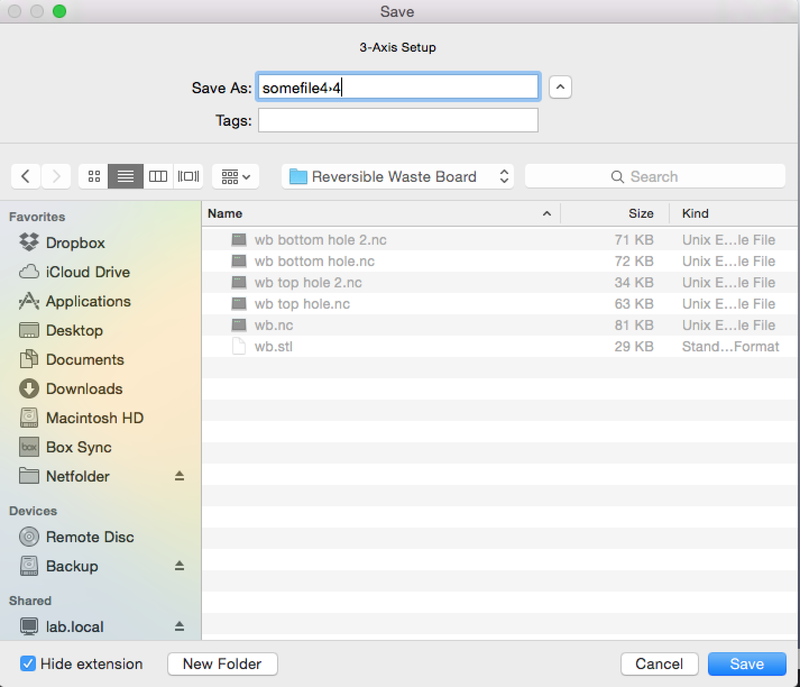 It is the plain OS-X “save as” dialog. I can see the extension is .nc but I can’t specify a format. Bottom line, to answer your question: I do not know which post processor I am using as I never knew one could specify one (which is probably why it flew under my radar). @TotallyFred, I’m sorry, the only Mac I have is a Plus so I have no knowledge of MC for Mac. Click Save Toolpath to save the toolpath. Select the name and location of the file. Select the correct post processor for your machine under Save as type. If you’re not yet sure which one to use select Minimum Gcode Config(*.nc). Click Done in the Accept Toolpath dialog. 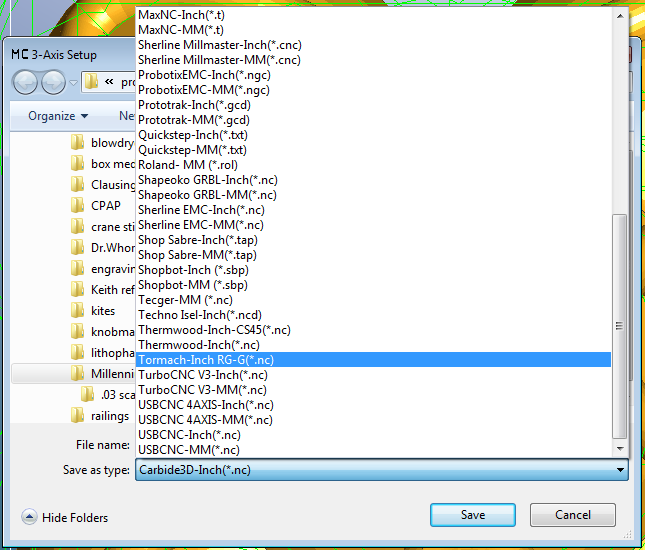 And from my pre-Nomad experience the Save as type dropdown does list all the postprocessors in the folder. MeshCAM’s help file is a little spotty–the only place I could find mention of choosing the postprocessor was in the Quickstart. I’ll need to do some digging. Interesting you can not select a postprocessor of your choice. I attached a screenshot of the save dialog (from the Save Toolpath). No place to specify a postprocessor either. At one point I suspected the extension would determine the post processor but multiple posts specify the same extension so that would be ambiguous (and so I suspect this is not what is happening). I hope Rob (@robgrz ) can shed some light on this… but thanks again for pointing me in the right direction! I think I’m going to call a bug here. 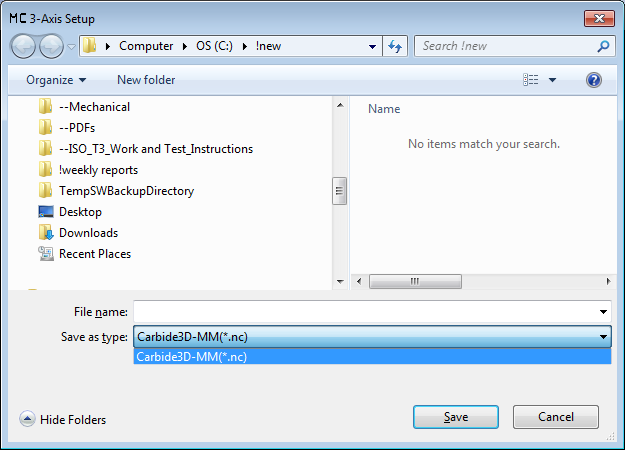 I should at least be able to select Carbide3D-Inch as the postprocessor. Of course that gives up the Carbide-specific menu choices. So the behavior definitely is connected with the Carbide3D license itself. You’re right Randy- the Carbide license for MeshCAM locks the post processor to the Carbide post that’s built in. This is intentional to eliminate the ability to produce code that’s incompatible with the Nomad or Shapeoko. Hi Rob, thanks for answering. I can understand the commercial reasoning behind that but the MC generated gcode is incompatible with the Nomad unless CM is used to preprocess it… It’d be really cool to have the option to generate pure Nomad code as CM has its own limitations. The WinBook is a slow sloth. But it does the trick. Do not expect to run MeshCAM on it, Carbide Motion will work though, just tried it. It doesn’t do ANYTHING good, can’t surf with too many tabs. The internal flash is as slow as a microSD card. It says 16GB but only has around 9, with 5 free when you first open it. The cameras on it are garbage. I’ve been experimenting with some Intel ComputeSticks lately, to use as “headless” controllers for my 3DP and Nomad. The Windows-version stick is giving me fits trying to get Remote Desktop or VNC to run properly, so I haven’t been able to try CM on one yet. But the Ubuntu-version stick has proven itself ready, willing, and able to run my 3DP wth Cura, and it even does local slicing and G-code generation surprisingly well. Just a thought, and excuse me if it’s already mentioned, has anyone tried the Kangaroo from Newegg? It’s $100 and seems decent. I bought one, stripped down all the crapware from windows 10 and setting it up to run the Nomad and a 3D printer. I have it running through an old ipad for a monitor and a logitech wireless mouse and keyboard. It’s a bit slow but seems to be fast enough. I’ll know when I get my nomad in and have time to test it. I am doing most of my heavy hitting work on my MBP running parallels and SW15. This would just be for an interface and the ability to set it up and walk away without having to leave my work computer. I also ran across this and thought it would be fun to build but the cost is over $1000 in parts alone. I’ve installed Win7 on my EEE PC. Carbide Motion installed successfully however I don’t have my Nomad yet so I can’t confirm whether it will run reliably. I’ll let you know in a couple weeks once my Nomad arrives. My WinBook has 8GB of Ram on Windows 8.1 and it’s complaining that it’s out of RAM after loading a large file into Carbide Motion. I disabled Windows Defender and Superfetch, and increased the page file a bit, to get around that problem. I have a dell latitude D830, but it’s running Linux (mint). Just got a 3D XXL used ( assembled but never run), and would like to use the dell as a dedicated laptop for it. Can motion and designer software run on Linux? I am afraid that while there was an early build of Carbide Motion available for Linux its development has been discontinued. One product in development which addresses this is Carbide Connect which would allow one to control the machine from a web browser — it was announced a while back, and will hopefully work its way through the pipeline soon.